Denmark is one of the most technologically advanced nations on earth. 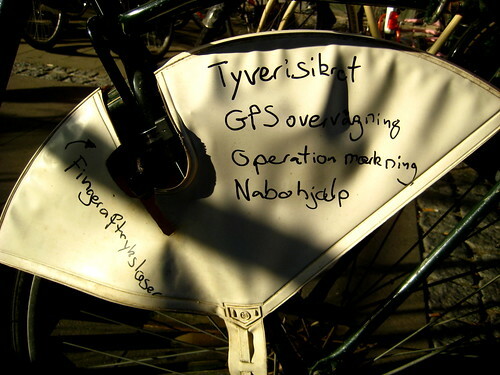 As illustrated by this hi-tech bicycle seen in Copenhagen. "Fingerprint scanner" - on the wheel lock. 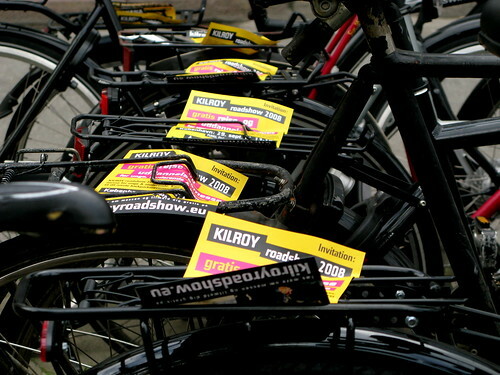 The bike racks near Nørreport Station had been visited by eager advertisers. Brochures for a travel agency on every back rack. Montreal is road-testing its own bike-sharing system that could serve as a template for other Canadian cities, including Edmonton.[...] with Montreal leading the way, Edmonton will have an appropriate model to study. The hope is City Hall will be doing just that over the coming year. Bike-sharing could well make sense here, at once improving the city's environment, along with the health of Edmontonians." Thanks for letting us know, Manfred. Good to see some bike-positive news from Canada.